I feel a little bit sad that I haven’t been here for such a long time (again) but for a variety of reasons I've been unable to share any of my creative projects. A few things have happened over the last few weeks which have made me want to dust off my poor neglected blog though, so here I am. I have made no progress whatsoever on the jumper that I started for EC just before Christmas 2015, despite having bought the yarn to finish this way back in January of that year. For some reason this project just hasn't inspired me at all but I'm just going to leave it close to my favourite seat so that it will be handy to dive into when the mood comes upon me to finish it. 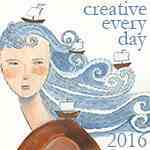 I fear that it could end up being another one of those projects which just never ends up being finished. I have abandoned all hope of ever completing the KCACO-Groovyghan Cal. In fact I spent a bit of time frogging the little I had completed earlier today so that I can use the yarn for something else. 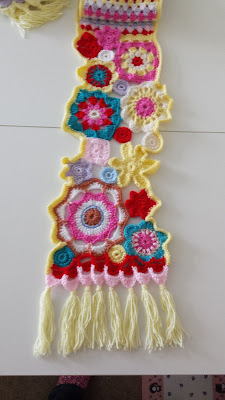 There were several reasons for abandoning this but the main reason was that I couldn't get the blocks to fit together for the life of me and the more that I tweaked the pattern, the more I hated what I'd made. It just didn't look like it was supposed to. It also didn't help because I hadn't thought my colour scheme out very well in the first place so I was left with a very limited palette of colours to work with. I have to admit that I found this massively restrictive -normally I take a fairly spontaneous approach to choosing colours and try not to over think the process as I find that it all usually comes together in the end no matter what you do. I didn't do that with this project and chose colours which 'matched' (in my head anyway!). Clearly it wasn't the best approach for me. 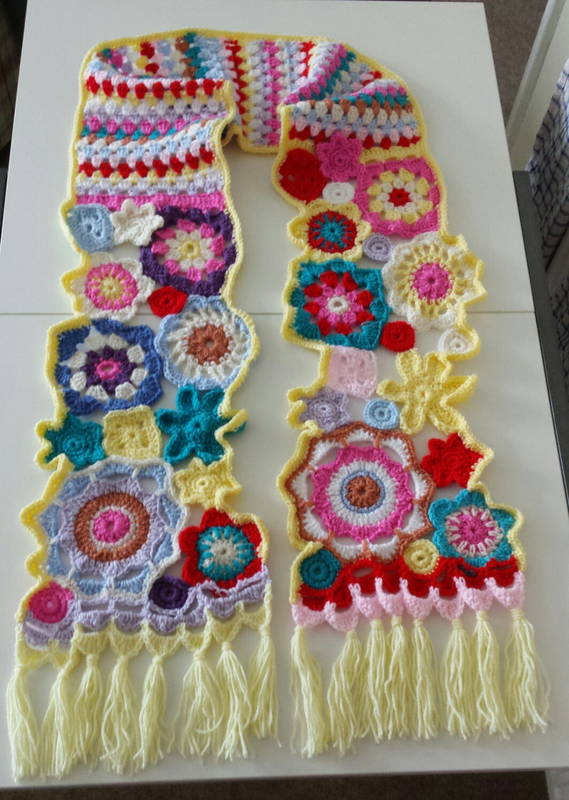 Happily, I have managed to finish the Scarf which I started well over a year ago. I really like the mixture of colours in this and I feel like it turned out pretty well. I have to admit that I wouldn't necessarily wear this myself but EC wore it quite a lot last autumn and throughout the wintertime. I think it matches her cheery, slightly eccentric personality perfectly! 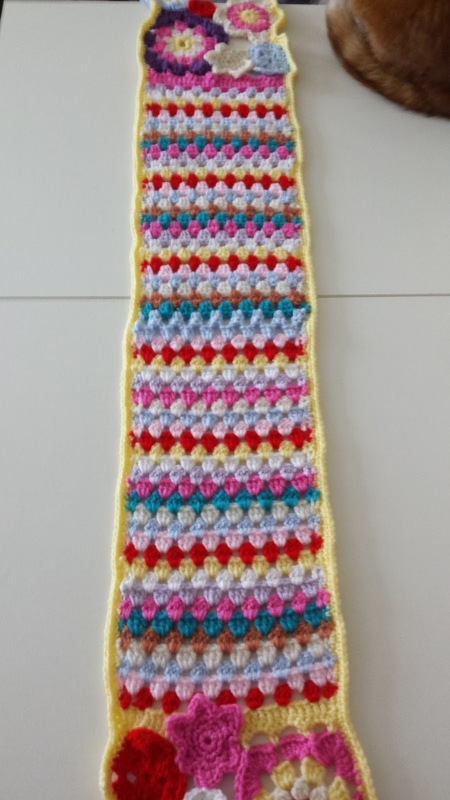 I tried not to make it too long (it's about 6.5') because I thought that the drama of the flowers might be lost and overall I'm glad I stuck to this length because they seem to fall just at the right place on EC. It looks a bit wonky from this angle but in person it is fine. You can just see Paul towards the top right of the picture. He really likes to be involved with whatever you may happen to be doing but especially when it involves crochet. 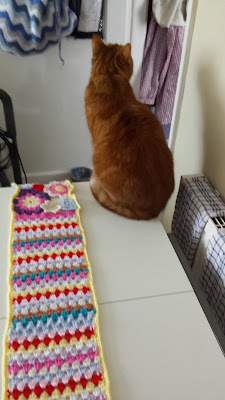 Here he is, sitting with his back to me in a huff because I wouldn't let him sit on the scarf for the photos. He is so funny! He made sure that I gave him lots of cuddles afterwards to make up for being so mean to him. I think there might even have been several cat treats involved as well. 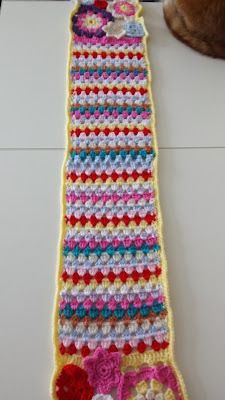 Overall, I was really impressed with the quality of the pattern for this scarf, which comes from Creative Crochet Workshop. The instructions were straightforward and because it was a means of using up scraps of yarn, it is (theoretically) an inexpensive project to complete. 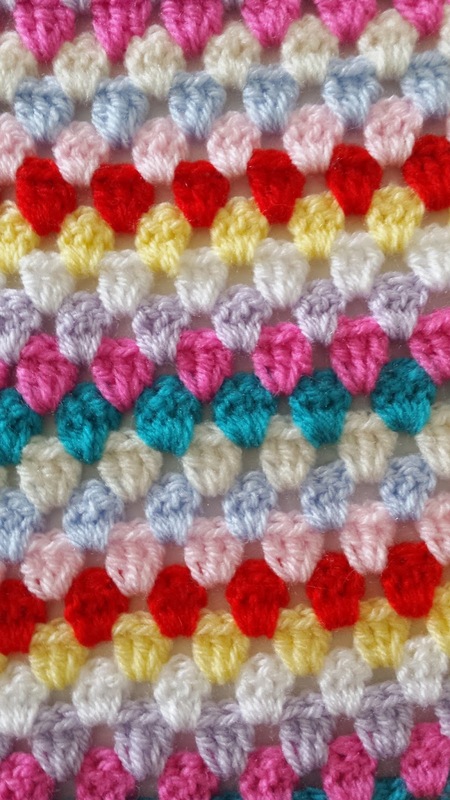 I used a fairly bog-standard acrylic double knitting yarn, mainly because it was pretty much what I had in at the time, but also because I was on a tight budget. 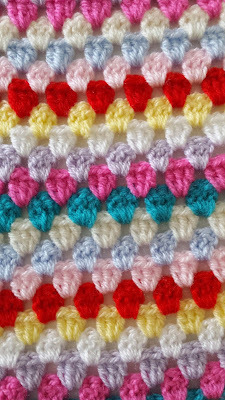 I really enjoyed making this scarf and would definitely make it again, although I do think it would be fun to use a mixture of yarns and make it truly freeform, a bit like I did Here with the little heart cushion.